This is a great way to make a perfect bun for every day or special occasions. I bought this for my four-year-old daughter for her first recital. It is easy to use (as long as I follow the directions). I really am impressed with how nice the bun looks! My daughter is a toddler and the bun looks a bit big, but it definitely serves the purpose. My daughter has light brown/blondish hair so I bought the "blonde" bun-head. It definitely meshes well with her hair color and I can't see the bun-holder at all. Overall, I am very happy with the product. Recently, several girls I know got one of these, so I decided to try it. I have thick hair, so when I put it on, my bun was ridiculously large. If you want to have a giant bun as a fashion statement, this will work. Also, if your hair is super thin, the bun builder jr. can make you bun normal sized. However, don't expect this to be you key to a sleek ballet bun. Personally I love this product. However this is a very large donut and works at dance conventions and for fashion purposes. Maybe even for competition dances or for company hair. But for auditions and ballet class this isn't the bun helper. You may want to get a whirl-a-style or a different helper for that class. Also this isn't for people with thin hair. People with thin or short hair will need to get the junior bun builder. Over all, I think that this a good product for certain people and different occasions. This does make an adorable bun, but it seems a little big. It's really not that bad though. Overall, I would recommend it. If your hair doesn't have enough volume, you won't be able to cover this thing, and then it will be pointless. If your hair is shorter, you also face the problem of not having enough hair to pin. This product will work best for those with mid-length and longer hair that is medium to thick. 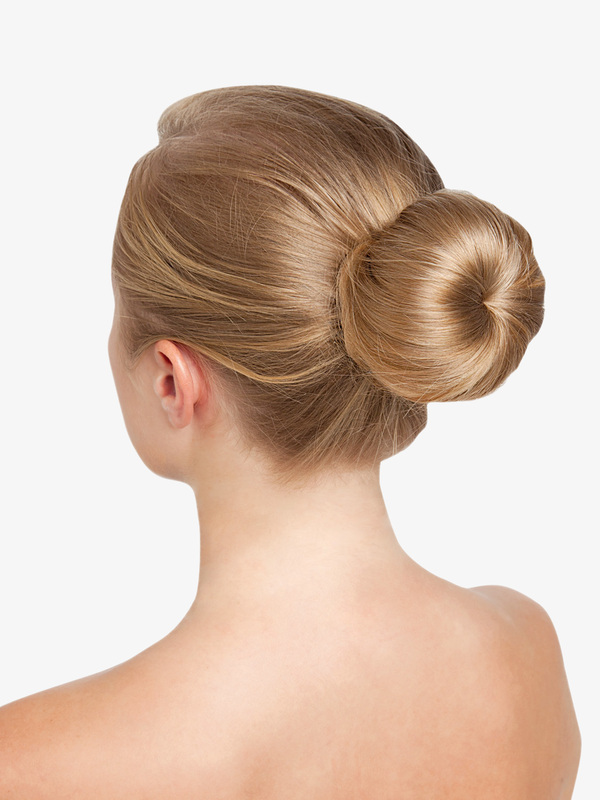 Bun inserts are great if you want a big, sleek bun, or if you have short, thin hair and want a voluminous bun. However, judging by the picture this insert is very large. It will be obvious your bun is fake, also you have to use the right pins to get it to stay. My hair is very long now and I don't use these anymore, but when my hair was shorter and made a teeny bun, I bought one of these hoping to get the big fat bun I always wanted. My insert was about the size of this one. I got a HUGE bun, and you could tell it was fake. It was fun for wearing out and about but I only wore it once to class because I felt like a cheater. xD If you just want a little bit more volume to your bun, you can get smaller sizes in different colors at Clares and I believe eBay. This is very much a statement piece so keep that in mind. To get it to stay and look right, arrange the hair all around the piece while tucking the extra hairs under and securing with plenty of bobbies. Then use some heavy duty pins, such as roller pins, to anchor the piece to your scalp. Grab some of the piece and scalp hair when doing this. Then add a hairnet if needed. I go to dance right after school with no time for putting my hair up. So I use this in the morning and it stays in all day and through all my dance classes! 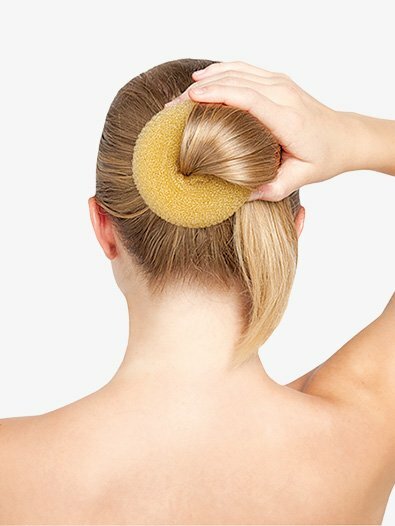 It takes just a few minutes and it creates a perfect bun everytime! This is a dance website but I found this bun maker to be a life saver when doing beauty during a pageant! It only comes with two bobby pins so it does need a few more. But over all I love this! I don't like this. Honestly it's much eaiser to do a normal bun with good bobby pins than it is to make a bun with this. I call it a cheater bun. I help teach a few classes a week and alot of my girls wear these. They always fall out in the middle of class. I would recommend learning how to make a cinnamon bun. This is wear you seperate your hair into two sections and spin one section and wrap it around your pony tail. Then you repeat that with the other section. Also you should toatally buy these heavy weight pins. they work so well!